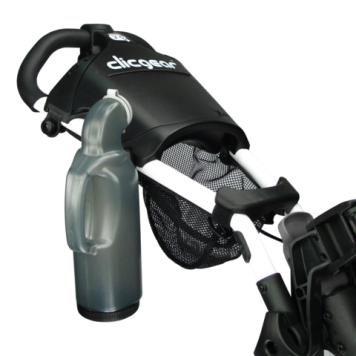 Replace your divots with the Clicgear® Sand Bottle. This accessory conveniently holds sand for reseeding divots. The Sand Bottle clips easily to the cart and includes (x2) separate mounting clips, one to be secured on the handle for sand to be close at hand while playing, the other is to be mounted near the lower bag support for use while the cart is folded and not in use. This accessory fits all Clicgear Model 1.0, Model 2.0, Model 3.0, Model 3.5 Plus and Rovic® Carts. It will also fit other brand name push carts with 1″ tubing. This product is supplied with (x2) Clicgear Accessory Tab mounts for easy installation.